You can grill, smoke and bake at exact temperatures by easily adjusting the patented air flow controls. You have total control over temperature at your fingertips, maintaining accuracy within a few degrees! The Made in USA precision temperature gauge provides accuracy to 750ºF / 400º C. Many indoor ovens cannot match the EGG's temperature control and accuracy! 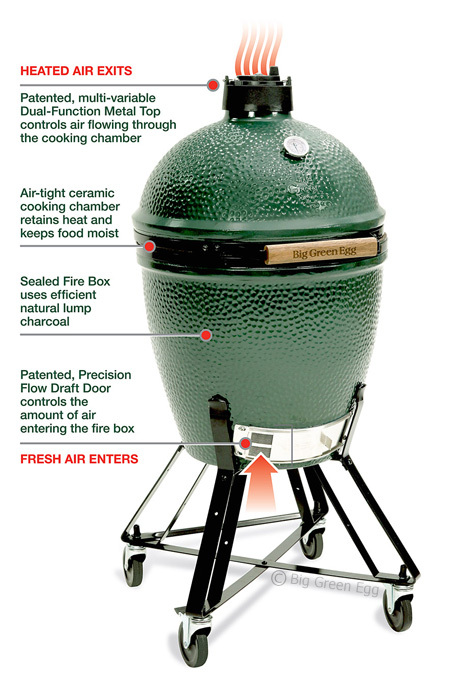 The Big Green Egg features a stainless steel cooking grid and an elegant green exterior with a lifetime glaze that maintains its good looks and wipes clean easily without chemical cleaners. Inside, residual heat burns away any grease build-up – just like a self-cleaning oven. What makes The Big Green Egg by far the best cooking device of its kind are the patented components and state-of the-art ceramic technologies that provide improved insulation, thermal shock tolerance and material strength. The high-quality ceramics used in each and every EGG will not crack or deteriorate over time, and many EGGs are passed down to the next generation. The Big Green Egg comes with a Best-In-Class limited lifetime warranty. If it doesn't say Big Green Egg, it isn't!